News Five Face-to-Face VASCERN Meetings held in May: MSA, HHT, HTAD and VASCA Working Groups! Five Face-to-Face VASCERN Meetings held in May: MSA, HHT, HTAD and VASCA Working Groups! 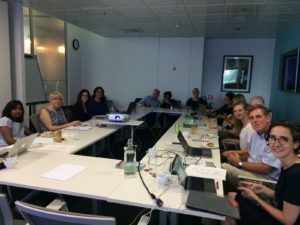 This May was a very busy month at VASCERN with four out of the five Rare Disease Working Groups (RDWGs) holding face-to-face meetings in various European cities. These meetings gave RDWG members the rare opportunity to sit down together and discuss their progress and action plans as well as advance in various work packages. The MSA-WG, Chaired by Dr. Leema Robert, held their face-to-face meeting on May 23rd, 2018 at Guy’s Hospital in London, UK. HCP members from France, Italy and the Netherlands were present as were ePAG representatives from Germany (ePAG Co-Chair for MSA-WG, Juergen Grunert) and Belgium. Topics discussed at this meeting included the soon to be available Patient Pathway for vEDS and the creation of electronic patient passports. The group also decided on the topics for their first PoKs and had a brainstorming session where all members were able to give their feedback on what they thought were the most important work packages to prioritise. In the afternoon some of the HCP representatives from the MSA-WG also joined the Pan-London Aortopathy meeting with Focus on Pregnancy. Dr. Leema Robert and Dr. Yaso Emmanuel gave a presentation entitled “Introduction to the European Reference Network (ERN) for Rare Vascular disease” where they presented our network to attendees. Other interesting presentations were given including an update on the Registry of Pregnancy and Cardiac disease (ROPAC). To see the Facebook post for the event, click here. 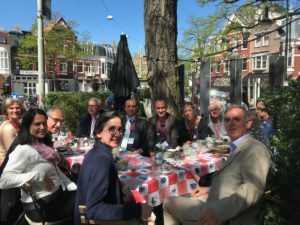 The VASCA-WG, Chaired by Prof Miikka Vikkula, held their face-to-face meeting on May 28th, 2018 in Amsterdam. HCP members from Belgium, Finland, Germany, Ireland, The Netherlands and Sweden were in attendance as well as guests healthcare professionals from France and Spain and six Patient Group (ePAG) representatives from Belgium, Germany and The Netherlands (including ePAG co-Chair for VASCA, Caroline van den Bosch). They discussed their current progress in the various work packages and Prof Leo Schultze Kool gave members an overview of the CPMS in order to encourage more Healthcare professionals to participate. This was also a networking event as additional team members from the VASCA-WG HCPs were in attendance and were thus able to familiarize themselves with the other members of the VASCA-WG and their projects. VASCA-WG members also were very active at the ISSVA 2018 meeting that followed during the rest of the week (May 29-June 1st, 2018). “A FAIR compliant registry for the vascular malformation centres within the European Reference Networks” by Prof Leo Schultze Kool (Chair of our Patient Registry WG). Other very interesting presentations involving VASCA-WG members included “Efficacy and Safety of Sirolimus in Vascular Malformations Refractory to Standard Care: Preliminary Results of a Phase III Clinical Trial VASE”, “Genetic Testing in the Diagnostic Workup of Vascular Anomalies”, “Activating mutations in PIK3CA are specifically localized in lymphatic malformation-derived lymphatic endothelial cells of young children: therapeutic implications” and “Hemangioma Sequelae In Infantile Hemangiomas Treated With Propranolol”. 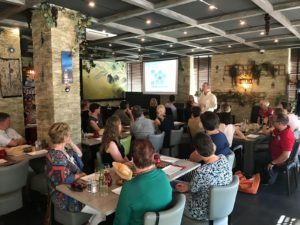 What made this ISSVA event even more special was that this year, for the first time, patient organisations were actively involved in its organisation (the promotional video for the event was initiated and financed by the patient organization HEVAS) and a Patient Advocacy Meeting took place on the afternoon of Tuesday May 29th, 2018. To see the Facebook post for the event, with additional photos, click here. 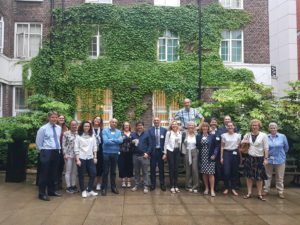 The HHT-WG, Chaired by Prof Claire Shovlin, held thier face-to-face meeting on May 29th at Hammersmith Hospital in London, UK. In the morning of the 29th, the HCP representatives (from Denmark, France, Germany, Italy, The Netherlands and the UK) had a doctors only meeting to discuss clinical cases, to select the list of topics for their second set of Do’s and Don’ts factsheets, and to review the clinical priorities of the group. In the afternoon the doctors were joined by patient representatives Claudia Crocione (ePAG Co-Chair for HHT) and Paolo Federici. The progress and acheivements of the HHT-WG were first summarized and topics presented included registries (with a very informative presentation on FAIRification of HHT data by Lieze Thielemans, a first year medical student at Imperial College who successfully made the data of 24 HHT patients FAIR) and the ePAG /Patient WG (with presentations by Claudia Crocione and Paolo Federici). Members then took turns giving the group an update on any clinical trials or research projects that were currently ongoing at their HCPs, which proved to be very informative. The topics for the new do’s and don’ts factsheets were prioritized with patient representatives giving their input on what topics were rated as the top concerns of patients with HHT. The overall core value of the HHT-WG of “Patient First, Safety First” was stressed by the Chair and the incredible productivity of the group, resulting from everyone working towards a common goal, was commended. The meeting was followed by a lovely meal at Imperial College in South Kensignton where participants had a chance to relax and enjoy a delicious dinner in an elegant setting after a very productive day of work. To see the tweets from this event, take a look at the Twitter Moment here. 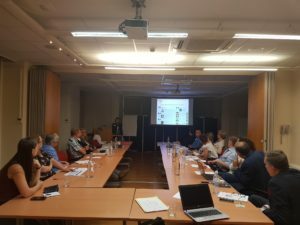 The HTAD-WG, Chaired by Prof Julie De Backer, held their face-to-face meeting in Brussels on May 29th, 2018. HCP members from Belgium, France, Germany, Italy, The Netherlands, Sweden and the U.K. were in attendance, as was a guest HCP representative from Spain. The ePAG Co-Chair for the HTAD-WG, Lise Murphy from Marfan Sweden, was also in attendance. The meeting was very successful as major advances were made in the various work packages. A presentation was given on the upcoming EU co-funded VASCERN mobile application (that will enable patients and doctors to easily locate our expert centers & ePAG patient organisations), major progression was made on the expert consensus statement (for HTAD in relation to mutations in ACTA2), and Patient Pathways and new Pills of Knowledge to be created were discussed. Subtitles for their first PoK, entitled Marfan Syndrome Diagnosis, by Prof Julie De Backer, will soon be available in various languages including French, German, Dutch, French, Italian and Spanish. Romain Alderweireldt, founder of the Fondation 101 Genomes (F101G) and ePAG representative/Chair of our Ethics WG, gave a presentation on the latest developments of the project. 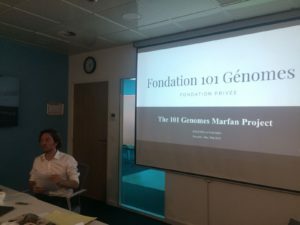 The HTAD-WG is actively involved in the pilot project of the F101G, the 101 Genomes Marfan project (P101GM), which involves the creation of a bioinformatics platform containing genomic and phenotypic cross-data from a cohort of 101 patients with Marfan syndrome. The Facebook post can also be found here. 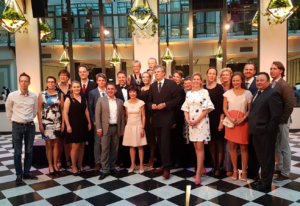 Finally, members of the Heritable Thoracic Aortic Diseases (HTAD-WG) were also in Amsterdam from May 3rd-5th, 2018 for the 10th International Research Symposium on Marfan Syndrome and Related Disorders. 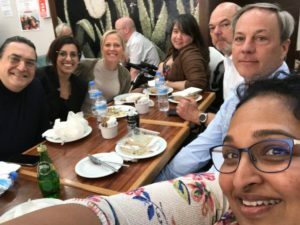 They took this opportunity to schedule a HTAD-WG Face-to-Face lunch meeting on Friday, May 4, 2018 to network and discuss ongoing projects in the HTAD-WG. These face-to-face meetings enforced the close collaboration between both HCP and ePAG reps of the various RDWGs proving that we are stronger together. We look forward to VASCERN Days 2018, our annual meeting that will take place from October 11-12th, 2018 in Paris, which will be an opportunity for more fruitful discussions and further progress to be made in the various work packages of our network. Pediatric and Primary Lymphedema WG: First Pill of Knowledge (PoK) Video!